Lately I have been wearing just the basic hoop earrings, and I forgot what it was like to stand out in a crowd with your accessories. I thought that it was time I change it this time around, so that I can get back to "standing out in the crowd." The Tiny Tassel is the perfect earring/ accessories to get attention in a crowd full of hoops. It is such a classic design, you just cannot pass it up. The Tiny Tassel earring is so lightweight, it makes you feel like you are not wearing earrings at all. 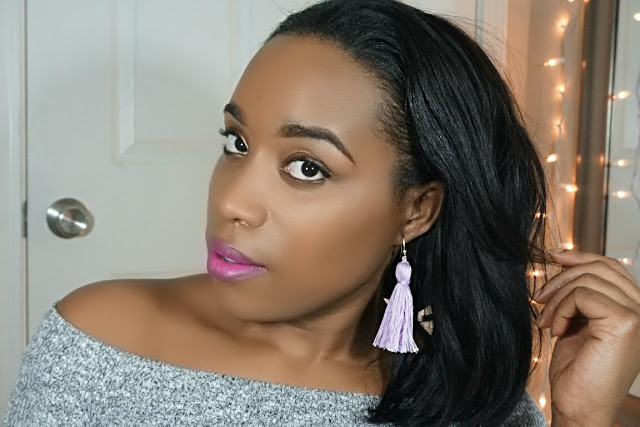 These lovely lavender tassel add the right touch to my style and personality; fun and girly. Thanks to The Tiny Tassel, I no longer have to be hoop. I am the pretty tassel in the crowd full of hoops. I can stand out and add the right amount of sass to my looks.